In the early days of thoroughbred breeding, broodmares got very little respect from bloodstock owners. It was a commonly held belief that foals got all of their attributes from their sire, while the dam merely carried and nurtured the offspring. This produced rather lopsided pedigree charts, with every detail of the stallions heritage recorded whilst many early mares were referred to arbitrarily, e.g. ‘Royal Mare’. It was only due to dedicated efforts by later breeders that these mares were identified and their lineage traced. In the 1700s, imported Middle Eastern stallions were bred to a mixture of mares to create the foundation stock of the thoroughbred, from which basically every modern horse is descended. Contrary to previous theories, many of these mares were actually native British and Irish bred horses, particularly the speedy hobby type of animal. Various Spanish and mainland Europe mares also contributed to the thoroughbred, but the influence of Middle Eastern mares was minimal compared to stallions. Some of the originals mares include: Burton Bard Mare (Carbine, Gainsborough and The Tetrarch are among her descendants), Oldfield Mare (ancestress of Pretty Polly, St Paddy and Brigadier Gerard) and Huston’s Spot Mare (Sir Galahad III, Sceptre and Ormonde trace back to her). Furthermore, the speed of the thoroughbred- it’s defining trait- has been traced to the distaff side of the pedigree, as opposed to the more stamina laden foundation stallions. Research has shown that horses with the C:C variation of a particular gene are more inclined to be swifter, sprinter types compared to those with the T:T copies of the gene, which promote endurance. A comparison of genetic material from historic thoroughbreds, as well as local breeds at the time (from whence foundation mares originated), show that the speedy C gene entered the thoroughbred population just once, likely from a single native bred mare. Single mares have wielded great influence over the breed at later points as well. One of the most significant broodmares was Pocahontas (1837- 1870), who had thirteen crosses to Eclipse in her pedigree. She was the foundation mare of Family 3n, and dam of some of the most important stallions in history. In particular, her son Stockwell (by The Baron) was hugely influential in the 1800s and became known as ‘the Emperor of Stallion’. His sons included the great sire Doncaster (sired Bend Or) and Triple Crown winner Lord Lyon, and he was the ancestor of dominant stallions Phalaris, Nearco and Native Dancer. Other successful sire sons of Pocahontas include Rataplan and King Tom, who was the broodmare sire of the incomparable stallion St Simon. Pocahontas is also speculated to be the source of a peculiar genetic mutation apparent in champion racehorses, the so-called ‘x-factor’ that gives an enlarged heart. Outstanding horses such as Phar Lap, Arkle and Secretariat displayed this trait, and careful analysis of their pedigrees has possibly traced the mutation, carried on the x-chromosome and therefore passed from dam to son, back to this 19th Century mare. Another great mare was the undefeated Perdita II (1881), who foaled three exceptional brothers by St Simon: Florizel II, Persimmon and Triple Crown winner Diamond Jubilee. Of the three, Persimmon was considered the most talented, and his dominance continued at stud where he was champion sire four times and sired the great filly Sceptre, who in turn produced several daughters who went on to become good broodmares. Plucky Liege (1912) listed St Simon as her broodmare sire, and had three crosses to Stockwell in her pedigree. Her progeny include Sir Gallahad III, one of the most influential sires in America, Bull Dog, sire of the brilliant stallion Bull Lea and Derby winner Bois Roussel, a sire of many winners and broodmare sire of champion filly Petite Etoile. Another granddaughter of St Simon, Selene (1919) also had a profound effect on the development of the breed in the 20th Century, especially at an international level. Her first foal Sickle (by Phalaris) was exported to America where he founded one of the most significant sire lines through his son Unbreakable to Polynesian and then Native Dancer, who was one of the most influential sires of the last century. Selene’s second foal and full brother to Sickle was Pharamond II, who also exerted considerable influence over the North American thoroughbred via his son Menow, who in turn sired handicap champion Tom Fool. Her third great sire son was the mighty Hyperion (by Gainsborough), although that covering almost fell through. Hyperion was a champion of the turf, but also a giant in the breeding shed where he sired eight Classic winners including Owen Tudor and Sun Chariot, as well as top class horses like Aureole and Khaled. Outstanding Australian stallion Star Kingdom is also a direct descendant of Hyperion. 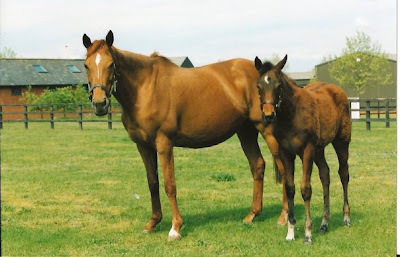 The true significance of broodmares is often not observed for many years unless they sire multiple top class racehorses, as the success and influence of their offspring’s descendants may take several generations to be fully realised. With respect to modern mares, perhaps the most important has been Urban Sea (1989), who produced two Derby winners in the Sea The Stars and Galileo, becoming only the second mare to achieve this feat. Galileo has gone on to become the dominant sire in Europe, and counts Frankel amongst his many top class offspring. In total she produced eight Stakes winners from eleven foals, before dying during foaling in 2009. If the success of Galileo’s first sons at stud is any indication, her impact on the breed will be felt for many generations to come.